The float of the Australian dollar in 1983 was the boldest and best change to this country’s economic framework in the last 70 years. The complication is the Australian dollar has traded over a very wide range; it’s made big and sudden moves; and consensus predictions of the exchange rate often turn out to be very wrong. The big drop in the value of the Australian dollar in the past 12 months (from 92 US cents to a little south of 70 US cents) was inevitable and desirable. Commodity prices have collapsed (by almost 30 per cent); our major export market, China, is slowing (currently, market expectations are that China will soon be in recession); the economy is lacklustre (growing at a rate of 2.25 per cent); and the Reserve Bank has cut the cash rate to a record low of 2 per cent (mainly to bring about a lower Aussie dollar). 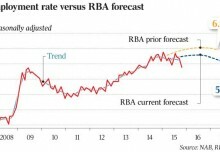 The Australian dollar is expected to move lower in coming months — and, given China’s economic problems and the prospect of an increase in the US cash rate by year-end, that seems a reasonable view to take. The medium-term outlook for the Australian dollar is for it to move down to about 60 US cents by mid-2016 and then trend around that level for a year or two. In my view, the Aussie dollar will remain highly volatile; perhaps its low point for this cycle will be reached well before mid-2016; and as (and when) China goes into its next cyclical upswing, the Australian dollar could pick up somewhat against the US dollar. 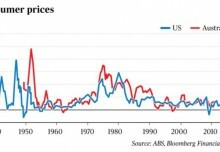 The dominant influences on the Australian to US dollar exchange rate, in both the short run and over the next few years, are likely to be the prices of the commodities we export — for which expectations for Chinese economic growth will be all-important — and the level of our interest rates relative to those in the US. Let’s take them in turn. As Deutsche Bank recently commented, “Although the exact date is still open, there is hardly any doubt that (US) rate hikes are in the offing … US Fed chair Janet Yellen may well prefer to make small steps in good time, instead of being forced to take the necessary actions to stabilise prices too late and under pressure.” As US interest rates move up, the US dollar could also push higher — especially against the Australian dollar, given that our cash rate is unlikely to be raised for a considerable time and, as the chart reminds us, bond yields here have already narrowed relative to those in the US. The differential in interest rates is likely to be the major negative for our exchange rate to the greenback. Much will depend on how the economic cycle in China plays out. Certainly, growth there has weakened, but, particularly in recent months, market gloom about China may have run too far. In the last couple of years, the prevailing view about China has been that the property collapse, and the failures among shadow banks that had financed the boom, would tip the economy into recession. In fact, house prices in the biggest Chinese cities have been picking up for about four months. These days, it’s the possible flow-on effects from the 35 per cent fall in Chinese share prices that are the main concern for many observers — even though linkages in China between the sharemarket and the economy are extremely weak. China’s trend rate of growth is declining as its GDP expands. Forecasts for growth rates averaging 6 or 7 per cent for the next half-dozen years are fanciful, but 4 to 5 per cent average growth seems achievable. Economic conditions in China will move cyclically around this (declining) trend rate of growth. The Chinese economy has reasonable prospect of avoiding the hard landing that’s currently priced into commodities. If this happens, and particularly if the global oversupply of iron ore is partially corrected by mine closures in China, the Australian dollar might not sit as long around 60 US cents as the consensus view in foreign exchange markets currently expects. Don Stammer chairs QV Equities, is a director of IPE, and an adviser to the Third Link Growth Fund and Altius Asset Management. The views expressed are his alone. 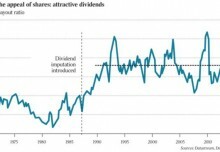 Shares priced for good times but what of bonds? 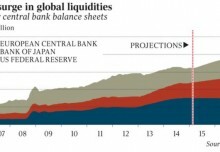 Have we forgotten the financial crisis already?